This is a very large national franchise with a unique product and brand. People will always want a place where they can treat themselves to something decadent. This franchise offers 20 flavors of French macarons plus 38 international pastries and sweets. They satisfy demands for gluten free, low calorie, low cost and authentic international treats. Fresh sandwiches and coffee are also offered in the full bakeshop. They offer the customer with the rare experience of getting artisanal European styled food for remarkably affordable prices.. Build in growth as you open three Kiosks in multiple locations over an agreed development plan. More locations are available for even more growth. 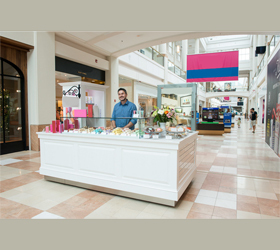 Multiple distribution channels also offer growth through your Kiosks, bake shops, pop-ups, holiday markets, weddings, B2B, gift sets and your website. You also get a split of corporate revenues sold through e-commerce in your defined territory.